Well, I didn't learn my lesson the first time and I went back to commenting over at All Things Conservative. That was clearly a mistake. The atmosphere for political discourse is at the lowest level I have ever seen it. It is sad, but I must consider the efforts to make ATC into a forum for a right/left dialogue to be a failure. Bill Crawford made it clear today what he thinks about the situation. The debate in this country is too partisan, and the blame for this lies squarely on the doorstep of Liberals. When I tried to respond to the above linked post, my comment was deleted. Since Bill feels that my comments at his site are abusive and disrespectful towards him, I will refrain from making them. I want to apologize for any percieved disrespect or discourteousness on my part. And my other one-time friend at ATC, Mark Harden, should be pleased by my self-imposed exile from the site since he has been campaigning for my banishment for the past several months. What I don't understand is why now? We've had this discourse going for more than four years. Why has it deteriorated to this level now? Digby has some timely thoughts on that question which I think are instructive. Clearly, people on the right are very, very angry right now and they are lashing out at their most hated enemies: Americans who disagree with them. What I think we are seeing is the result of pent-up frustrations over the war in Iraq which has not gone as they expected and the realization that Hillary Clinton is likely to be our next president along with a veto-proof majority in Congress. But whatever the reason, it has become practically impossible to carry on any kind of politcal discussion between right and left that does not quickly deteriorate into namecalling and hurt feelings. But at least one good thing may come out of all this. The one other liberal commenter at ATC, Ann, is using this most recent blowup as the impetus to start her own blog. I will link to it as soon as she gets it up and running. 154 Republicans and two Democrats voted to uphold Bush’s veto of the State Children’s Health Insurance Program (SCHIP). That was just 13 short of the two-thirds majority needed to override. Republicans should pay a heavy price at the polls for this outrage. At a minimum, Democrats need to extract 13 seats from Republicans in the 2008 elections, perhaps more. Bush has used his veto power exactly four times during his two terms in office: twice to derail legislation in support of stem cell research; once to make sure our troops stay mired in the Iraqi muck for all eternity; and now to shoot down a bill extending health insurance to 10 million children who currently have none. Now Democrats are planning to introduce legislation that will have a few meaningless alterations, but will essentially cover the same number of kids. It is expected that Republicans will cave at that point and allow it to pass. But as far as the electorate is concerned, the damage is already done. This was a monumentally stupid thing for our president to do to his own party. Republicans are fleeing Congress by the truckload. Everyday seems to bring news of a new Republican retirement and it is just adding to the electoral woes of the party. Some members, like former Speaker Denny Hastert can’t even wait until the end of their current term to bailout. Good riddance. Pete V. Domenici, 75, N.M.
John W. Warner, 80, Va.
* Hutchison is not up for re-election until 2012, but she may step down in 2009 to run for Texas governor. J. Dennis Hastert, 65, Ill.
Charles W. "Chip" Pickering, 44, Miss. Heather A. Wilson, 46, N.M. The two Democrats leaving the House are running for Senate seats in their respective states. While rightwingers continue to delude themselves about the toll the Iraq war is having on our military, the evidence that it has been detrimental keeps piling up. There are new signs that an American military in distress is reshaping itself to cope with the destructive fallout of Iraq — and to look beyond it, even as President Bush insists on dispatching Americans to go on fighting and dying there. Young officers have been offered big cash bonuses to stay in an Army struggling to retain them. The Marines, meanwhile, are trying to move out of Iraq and into Afghanistan, a more popular mission where they could focus on America’s real enemies — al Qaeda and its allies, the Taliban — instead of trying to police a civil war. The unprecedented bonuses — up to $35,000 — are a sign of desperation. Lengthy and repeated tours in the war zones of Iraq and Afghanistan have created critical shortages of younger officers in such important specialties as military intelligence, aviation — and even in the infantry as more and more men and women choose to leave the service rather than re-enlist. The Washington Post reported that when its expansion plans are factored in, the Army is projecting a shortage of 3,000 captains and majors annually through 2013. It has also increased the number of so-called ''moral waivers'' to recruits with criminal pasts, even as the total number of recruits dropped slightly. The sharpest increase was in waivers for serious misdemeanors, which make up the bulk of all the Army's moral waivers. These include aggravated assault, burglary, robbery and vehicular homicide. In the meantime, our military capability is eroding, according to then chairman of the Joint Chiefs of Staff Peter Pace. Commandant Gen. James Conway said Monday he is concerned about the Marines Corps' ability to respond to security flare-ups around the world on short notice because of the demands put on it by the Iraq war. The director of the National Counterterrorism Center, the primary US organization responsible for analyzing terror threats, told NBC News that the nation is probably not "tactically" safer from the threat of terrorism following the invasion of Iraq. Asked by reporter Richard Engel if the war in Iraq had created a "giant recruiting tool" for terrorists, Center head Scott Redd said that "in the short term, that is probably true. But the question is you've got to look at this, I believe, in the long term strategic view." "Tactically, probably not," Redd said in response to a question about whether the US is generally safer after having invaded Iraq. "Strategically, we'll wait and see." It looks like I will owe someone lunch pretty soon. I made a friendly wager with a blogging buddy over the baseball playoffs and so far my picks haven’t panned out. I put all my money on the Yankees to go back to the World Series this year only to see them get bounced out in the first round by the Cleveland Indians. And in the National League I was betting on the Arizona Diamondbacks who fell to the Colorado Rockies in Round 2. The Yankees haven’t won a World Series since they benched Chuck Knoblach in 2001. I’ve referred to this in the past as The Knoblauch Curse. I was betting that this might be the year that the Yankees would finally overcome that curse, but it was not to be. The team is little recognizable from the Yankee squad that won three consecutive World Series titles between 1998-2000. Only Derek Jeter, Jorge Posada, Mariano Rivera and Andy Pettitte remain. And I suppose you can count Roger Clemens who came in at the end of that era. But the other big factor is Joe Torre, the manager, who has been at the helm since 1996, the first year the Yankees won the World Series during their most recent streak. But now that Torre failed to guide the Yanks past the first round of the playoffs again there is much talk that Yankees owner George Steinbrenner will can him. That would be an incredibly stupid move and guarantee that the Yankees would drop out of playoff contention for the forseeable future while they struggle to rebuild from the ground up. Torre is currently the 8th winningest manager in Major League Baseball history with 2,067 victories for a .539 percent Win-Loss percentage. 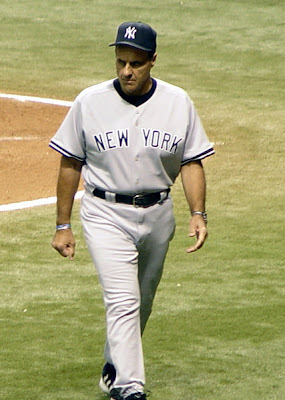 He has managed to get the Yankees to the playoffs every year since 1996 and made it to the World Series six times, winning four. That is an incredible managerial record any way to spin it. Steinbrenner should take a lesson from history and look at a manager even higher up on the win list than Torre - Sparky Anderson, the skipper for the Cinncinnatti Reds during the hey-day of the Big Red Machine. Sparky led the Reds to four National League Championships in eight years and two World Series victories. But in 1978 the Reds management decided to shake things up and sent Sparky off to the struggling Detroit Tigers. It took a few years, but by 1984 Sparky was back in the World Series with a championship team while the Reds floundered during that period. If the Yankees stick with Torre and continue to ride the wave he has been on they might pick up a few more pennants and World Series crowns before it is all over. But waves like that don’t come along everyday so they had best not jump off too soon.